The Wenk family has been farming the same soil in Adams County since 1842. Since then farm has seen many changes. In the 1950s orchards were added to the land, and gradually fruit became the family’s main business. 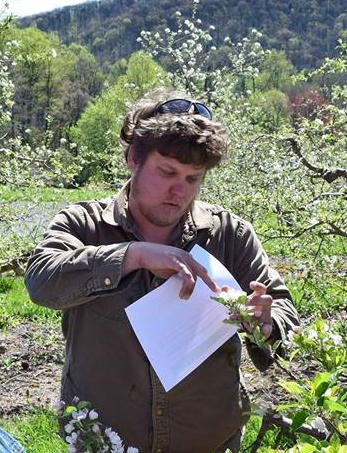 Ben Wenk, part of the seventh generation to run the farm, has steered Three Springs through its most recent transition, away from selling to large-scale processed fruit distributors and toward selling fresh produce at farmers markets and to restaurants and retailers (like yours truly). They’ve also started producing their own farm-made goods like jams, sauces, and hard cider. Adams County is well-known for being an ideal climate for fruit orchards, though the high levels of annual rainfall and a history of conventional farming in the region make organic fruit production very difficult. But Three Springs cares about sustainability. They use Integrated Pest Management (IPM) to limit the need to spray pesticides. IPM encompasses a wide variety of methods to monitor pest populations and weather conditions, so that spraying only happens when it is absolutely essential to save a crop. It also implements innovative, non-spray pest deterrents including Pheromone Mating Disruption and the protection of pest-eating insects. Three Springs is also Food Alliance Certified, which scores farms on a variety of factors, including safe and fair working conditions; reduced risk from pesticides and other toxic or hazardous materials; protection and enhancement of wildlife habitat and biodiversity; conservation of soil, water, and energy, and reduction and recycling of waste; and food product integrity, with no genetically engineered or artificial ingredients. We feel lucky to carry fresh, responsibly grown fruit from Three Springs year-round. Apples start showing up in late summer, then fall means cider time! The apple crop usually lasts through the winter, often long enough to overlap with the first stone fruits in late spring. We can’t carry Ploughman (hard) Cider, but keep an eye for their occasional pop-ups in the Market!